Hi-on Maiden are the worlds longest running and ONLY Iron Maiden tribute band officially endorsed by Iron Maiden themselves. With a history spanning 13 years, and personal endorsements from Steve Harris, Bruce Dickinson, Adrian Smith and Nicko McBrain, Hi-on Maiden are the closest tribute you'll find to the real Iron Maiden! 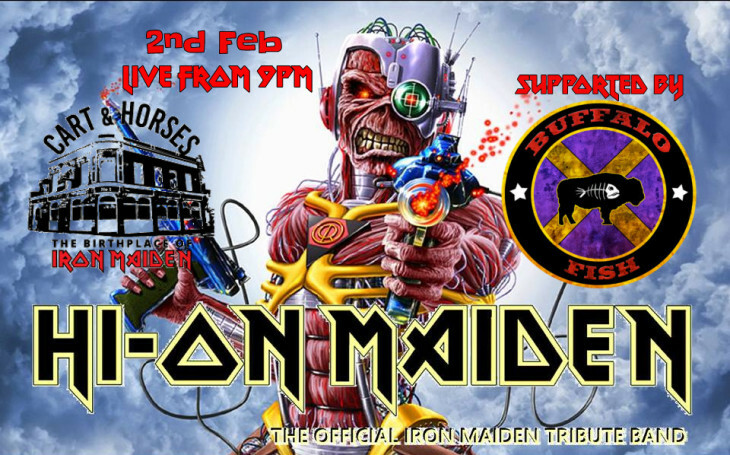 Ex-IRON MAIDEN guitarist TERY WAPRAM with his band Buffalo Fish will share the stage with Hi-On Maiden for full on Maiden Night here. Football early kick off or any other event days we are open from 10am.